The Badger Renegade Krome comes in a really nice padded case along with the 0.33mm needle/nozzle spear set up, the Krome is fitted with 0.21mm set up. IN THE BOX 1. Renegade Krome Airbrush 1. Needle Set 1. Spray Regulator with out horns 1. Air Hose Adaptor 1. 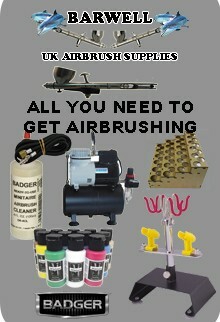 Instruction leaflet, Badger Airbrush / Iwata Hose Adaptor 36-010. 0.33mm Needle/Nozzle spear Set Up. "Tensionsense" ultra responsive trigger stability control system. "Stopset" accu-precision trigger setting mode . Exact taper fit, non-thread micro-precise paint tips. "Pointperfect" carbide polished needle micrology . "Smartcenter" nozzle technology with a patented "guide and hold" assembly design that ensures perfect paint tip centering for tighter line production. Trigger and back lever have been treated with Glide-Coat which gives an incredibly smooth trigger action.